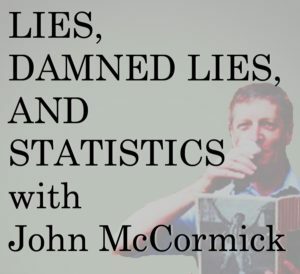 You are here: Home › McCormick's Craic › McCormick's dodgy numbers › Barnsley and Doncaster (and Accrington?) push Sunderland down and Walsall out. My “how’s it going?” piece went up on Friday, as per usual over the last few international breaks, and elicited few responses, as per usual over the last few seasons. I had expected one or two Coventry ninjas (there can’t be many more than two) to pick up the series and comment but it appears to be beyond them. Not that it matters. One appreciative reader, Edward, made a comment and that got me thinking, so I did a bit of fiddling with the spreadsheet and here we are. (I stopped at 7 because the 8th club were Luton and, having played Barnsley, they were on 13 games). Two hours later it was all change again. Yet the situation isn’t any clearer. Barnsley temporarily unravelled their game in hand and moved into second but found they’d dropped to third by the end of the day. Comparing the two tables shows how incredibly tight it is at the top of League One, and how much a failure to gain points matters. To that extent, Edward’s comment about draws has some substance. If we had hung on against Peterborough we’d have been level on points with Barnsley and ahead of Posh at the 12-game stage. 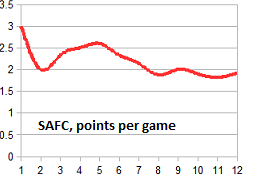 As it is, our points per game ratio has fallen and is now some way below our rivals, which is why they are some way above us in the league. We’re not the best when it comes to winning. OK, perhaps, but nothing more. Not in the Portsmouth class. That’s because we can’t keep a clean sheet. Barnsley have held out in almost half of their games. We’ve done it once in twelve games. Yet we have always scored. Always. Every game. No other club has done that. And not only do we have the League’s top scorer in Maja, we have eight others who have scored. So we don’t lose many games. It’s small numbers so far, so perhaps not that reliable a stat, but we’re as good as anyone in the League and better than most when it comes to getting at least a point. It’s obvious, isn’t it. So obvious that everyone knows it without my charts and tables. Don’t worry about our attack, Jack. Just sort out our defence. Make Edward, myself and 30,000 others happy. Keep some clean sheets and our forwards will convert those draws into wins. I think Jack’s up to that task. I suspect Pete Sixsmith will be thinking much the same. He should be here tomorrow or Tuesday with his own take on the first quarter of the season, and while my stats might point to some areas his analysis will shine a torch on them. It’ll be an excellent read and we hope you’ll visit us to enjoy it. Thanks for that info, there’s a lot to be gleaned from it. 50% win record quite good. 8.3% loss record excellent. 41.7% draw record slightly concerning and 0% clean sheets disturbing. After the last few seasons, should we complaining/moaning/concerned about our performance? If we want to get out of this league, then yes, we need to be looking at areas where we can improve. Keeping some clean sheets could help. Are we conceding goals because we’re attacking and therefore leaving gaps at the back, or are we conceding goals because there’s something not quite right at the back? I think that the GK is excellent, so I’d be looking at the defence/midfield. Would I rather we kept clean sheets at the expense of banging in goals? Not if goals scored is greater than goals conceded, but a string of clean sheets would help the back lines and work against the teams we’re playing.